The 1st truck drove through the 20,000 anticipating attendees and dumped its load of over-ripened tomatoes onto the streets. In bursts of elation the crowd surged towards the missiles and began throwing them at whichever hapless soul happened to fall within range. The wait was over. La Tomatina had finally begun. The true origins of what has now become the world’s largest food fight are unclear. The official story starts on the last Wednesday of August in 1945, when the ‘Giants and Heads’ festival was being held in the streets of Buñol, a small village in the Valencia province of Spain. During the celebration a group of teenage boys started charging through the parade, subsequently knocking over one of the costumed performers. In a fit of rage the irate entertainer began throwing whatever he could get his hands on into the gathered crowd. An unfortunate vegetable stall was targeted and tomatoes were hurled in every direction. Soon the entire audience became involved. The disturbance eventually subsided, but was not forgotten. The next year at the same festival some mischievous folk came armed with their own tomatoes and took great satisfaction in reenacting the previous years shenanigans. I wonder what the instigators would think if they could see what happens in Buñol today. All-you-can-drink sangria parties, organised tour groups full of highly intoxicated backpackers and of course the climbing of a greased-up pole to reach a ham tied two stories above the masses. 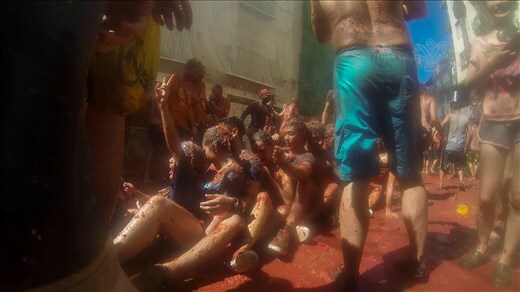 La Tomatina has grown into one of the more popular festivals in all of Europe. On the final Wednesday of August in 2014, Buñol was suffering from a record-breaking heat wave. Temperatures had peaked at 42 degrees celsius. The crowd was getting restless as person after person failed to reach the ham. Drunken ideas of glory had taken over the minds of some selfish climbers as they dragged down anyone who got close to the ham, instead wanting it for themselves. The concept of teamwork was diminishing. Various nationalities became so patriotic that it got to the point of being uncomfortably racist. Country-specific slogans and chants sang out over the festival and there were even suggestions of not allowing anyone from different countries being permitted to ascend the pole. Intoxicated individuals took violent turns with pushing and shoving turned into brief but intense physical fights. Clearly the sangria and heat were not mixing well together. La Tomatina has grown from its strange beginnings in 1945 to at its peak hosting 50,000 people. The festival had expanded to such an unmanageable level that in 2013 the city of Buñol decided to implement a ticketing system to try and bring some control to the mayhem. Now capacity is capped at 20,000. This has helped to bring down instances of violence, theft and minor sexual harassment. Watching the chaos unfold before me I became jaded and turned to my Thai friend, motioning that we should move to the outskirts of the congregation. We stepped away from the madness and immediately felt relief as the ability to breathe normally returned and the overall atmosphere became more light-hearted. 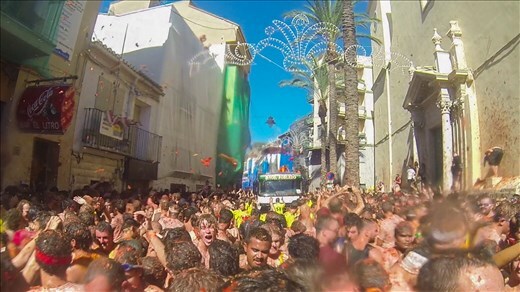 The heat was still overwhelming but the Spaniards positioned on the balconies overlooking the street took pity on the exhausted partygoers and threw bucket loads of water to cool the people down. Away from the ham huge fire hoses were employed to do the same thing. 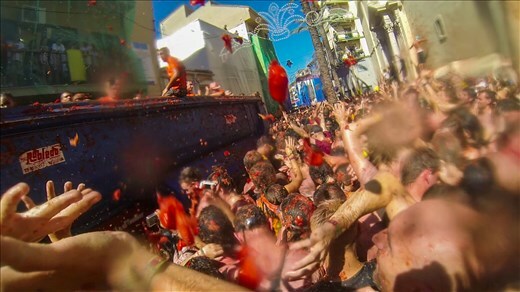 Traditionally the tomato fight begins once the ham has been obtained. Today, with the lack of help provided to those who sought to acquire it, it would remain on the pole. At 11am a loud blast rings out over Buñol which signals that the festival is to commence. Screams and cheers of exuberance echo off the buildings. Soon the bedlam will be upon us! While the lorries crawl through crowd I realise that I have never been in a situation quite like this before. Questions start running through my mind. Where does the 100 tonnes of tomatoes actually come from? How do the local people feel about their town being overrun with tourists for one day a year? More pressing, what does a tomato hitting your face actually feel like? I do not have to wait long for that last answer. I am struck just above the eye by an airborne missile. It shocks me, but the impact does not hurt. I realise that choosing to not buy goggles was a poor mistake as the juices start to stingily seep into my retinas. I don’t have much time to dwell on the pain though as the onslaught picks up the pace and it dawns on me that I am now in the centre of the world’s biggest food fight. Truck after truck drives through, dropping their load of tomatoes directly onto the road. We hustle to get a hold of more projectiles. Eventually all that is left is the mush strewn all over our bodies. Chunks fill the streets. We begin scooping up handfuls of raw bolognese and rubbing them all over anyone who we cast our eyes on. There is no escape from the mess, and no one wants to escape. 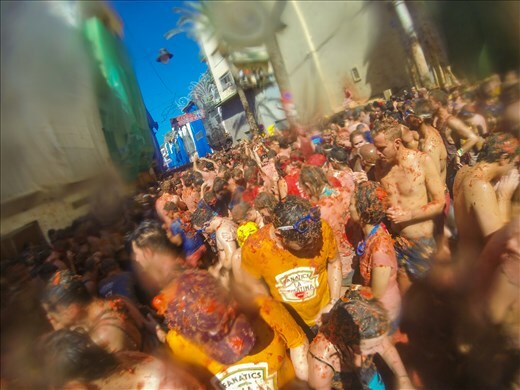 There is no choice but to embrace La Tomatina, laughing and attacking each other in jest. The ill feelings from the earlier hours have vanished. Only excitement is left. Some ambitious souls begin to swim and dive through the waste once it reaches ankle height. Inhibitions are lowered. Happiness beams off of the red-stained faces of every reveller present. One hour passes and a second blast is shot out over the town. La Tomatina has come to an end. Surprisingly everyone complies, and tomatoes are dropped. People who were moments ago targets and temporary enemies of each other now hug and introduce themselves. New friendships are quickly formed. The crowd shuffles away from the location of the war to the locals that are waiting with garden hoses to wash us down. The clothes we are wearing are completely ruined; The smell of tomatoes will be embedded in them forever. City workers have already begun to clean up the mess. Soon there will be no evidence outside of photos and memories that today ever took place. I look up and down the streets and think back to the Giants and Heads festival, the day that started it all. When one man’s fit of fury turned into a legacy that unites people from all around the globe. Thanks to his initiative, I will never look at a tomato the same way again. Jarryd Salem was the talented winner of our 2014 Travel Writing Scholarship. He attended La Tomatina festival as part of his European writing adventure. Check out his blog NOMADasaurus to keep up with his travels.